Spaniards will have to further tighten their belts as new taxes and spending cuts are being introduced. Prime Minister Mariano Rajoy has announced new austerity measures in order to slash the budget deficit by €65 billion by 2014 as Spain struggles to meet tough targets agreed with Europe after five years of economic stagnation and recession. Rajoy proposed a 3-point hike in the main rate of Value Added Tax on goods and services to 21%, and outlined cuts in unemployment benefit and civil service pay. He also announced new indirect taxes on energy, plans to privatise ports, airports and rail assets, and a reversal of property tax breaks that his centre-right People's Party restored last December. The Prime Minister pledged in his election campaign last year not to raise VAT now says he had no choice. The main rate will rise to 21 from 18% and the reduced rate to 10 from 8% in a move that could further discourage consumer spending. 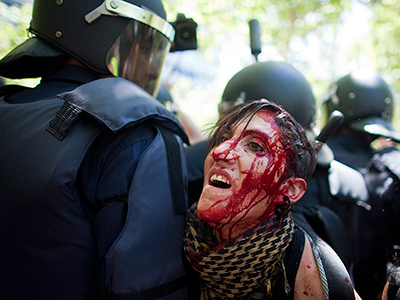 Prime Minister Mariano Rajoy’s tax hike announcement has received a hostile reception from ordinary Spaniards. 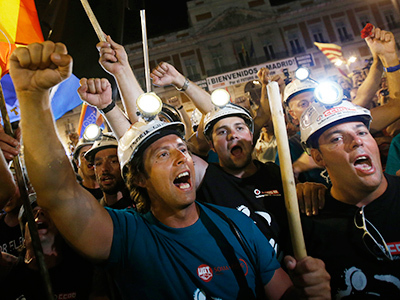 Miners have spent the last two weeks walking from the north of the country to join tens of thousands of at a protest in the centre of Madrid. Police have fired rubber bullets during the demonstrations. The tax rise announcement was been criticised by the opposition. "These measures are not pleasant, but they are necessary. 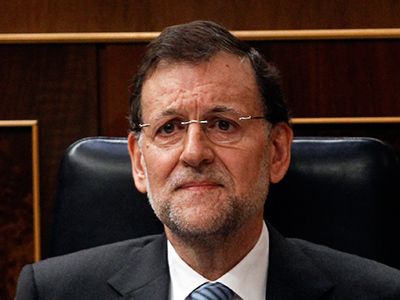 Our public spending exceeds our income by tens of billions of euros," Rajoy told parliament. Rajoy kept his election promise of leaving pensions unchanged. With the latest measures Rajoy has completely overhauled his budget plan, in which the central government and 17 autonomous regions put in place some €48 billion in savings for 2012, which has been insufficient to bring the deficit into line. The high deficit and ailing banks, which will receive up to €100 billion in European aid, are fuelling investor concern that Spain could join Greece, Portugal and Ireland in needing a sovereign bailout. 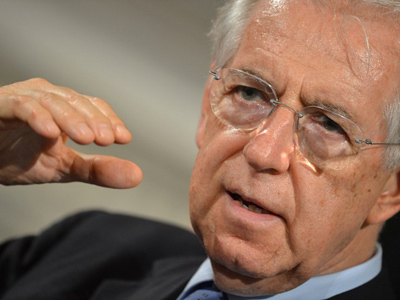 Italy’s government has recently approved €26 billion in cuts over the next three years in order to reduce debt and to head off a new tax increase. The EU agreed on Tuesday to give Spain more time, until 2014 instead of 2013, to bring the public deficit down to 3% of gross domestic product and eased this year's target to 6.3%. However, a European Commission document said even that easier target would be difficult to reach. Madrid's borrowing costs have soared in recent months, with the yield on the 10-year government bond breaking the 7% level regarded as unsustainable. On Wednesday, that yield fell to 6.81%. Italian yields are hovering close to 6%. Both countries' borrowing costs eased on Wednesday after Spain unveiled the new austerity measures. With unemployment in Spain hitting 24.4% and tax revenue falling, the country is struggling to meet the tough deficit cutting targets agreed with the EU. Meanwhile, OECD Secretary General Angel Gurria says high borrowing costs are dangerous for Italy and Spain and the EU must tackle them quickly by establishing a system that supports countries which are making reforms. "We are now facing pressures on Italy and Spain which are very dangerous if we do not tackle them immediately," Gurria said. "They are doing all their homework … yet we still don't have a system that supports or rewards virtues, good policies that actually protect countries that are doing the right things." EU leaders agreed at an end-June summit to allow the rescue funds to stabilize bond markets by intervening directly. But there has been some backtracking on the plan, with Finland and the Netherlands voicing opposition. Gurria praised efforts in Italy and Spain to reform the labor market and to rein in public finances, but said it was up to European Union institutions to act swiftly to restore confidence in the euro zone. Gurria also said the European Stability Mechanism rescue fund, or ESM, needed to become operational as soon as possible so it could start intervening on the bond markets, and that it should be strengthened to send a clear signal to markets.